Although retinol was first introduced to the scientific community all the way back in the 1940's, it didn't reach its peak popularity until much more recently (somewhere circa 2016, perhaps?). Once it was made known that retinol could treat and prevent some of the most stubborn skin concerns—such as fine lines and wrinkles, uneven skin tone and texture, and acne—people caught on quick. Now it's quite literally everywhere, being found in almost every skincare product imaginable, from moisturizers to serums to eye creams, and more. We thought we'd seen it all, but we were wrong, because today the world's first-ever drinkable retinol was launched. That's right, it's retinol that you drink. It was launched by Dirty Lemon, an nutricosmetics brand that offers a variety of supplemental beauty drinks, like matcha, charcoal, collagen, turmeric, ginseng, valerian, and now retinol. It's formulated to treat the skin from the inside-out, kicking collagen production into gear in order to create a plump, glowy, and youthful complexion. Keep scrolling to read all the details and see the drink that has kicked off the brave, new world of retinol products. The purpose of this new retinol-infused beauty water is similar to the purpose of other more traditional retinol-infused beauty products; it's just a different (perhaps easier?) delivery. The brand claims it will reduce fine lines, maintain skin elasticity, and even do a number on inflammation and redness (as someone who deals with a minor case of rosacea, the last one really piqued my interest). The retinol, which is a derivative of vitamin A, just works from the inside-out instead of the outside-in. But how exactly does it work? It's actually quite simple. Vitamin A stimulates the production of fibroblasts, which are tiny cells found in the connective tissue of the body. They're responsible for cell renewal and collagen production. As we age, fibroblast production declines, as does natural cell renewal and collagen stores, which explains why we start to see fine lines and wrinkles, sallowness, and other signs of aging on our skin. Retinol/vitamin A is thought to counteract and prevent that, which is why Dirty Lemon included 100% of the daily recommended amount of vitamin A into each bottle. Dirty Lemon didn't use any basic form of retinol, however; they used "pro-retinols" instead. "Pro-retinols are a milder form of vitamin A derived from retinyl esters that metabolize in the body as retinoic acid," explains Dr. Laurie Brodsky, N.D., who works as a medical advisor the brand. "Many people don’t realize that vitamin A from plants (provitamin A) is not the same as active vitamin A (retinol). Beta-carotene, the type found primarily in plants, needs to first be converted to active vitamin A in order to be utilized by the body....This takes place in the intestinal mucosa and the liver. By ingesting retinyl esters like retinyl acetate and palmitate, you are essentially bypassing the intermediary breakdown steps of vitamin A to provide an easier format for the body to use." "Studies show that vitamin A can be very effective at boosting collagen production, reducing fine lines and stimulating new blood vessels in the skin," Brodsky says. "Vitamin A is also known to stimulate new blood vessels in the skin, which results in fresh oxygenation and increased circulation/blood flow that aids in the removal of toxins at the skin surface for a more youthful, improved skin tone." Most of the scientific research concerning retinol that Brodsky refers to is centered on topical application (i.e. skincare products, not ingestible beauty drinks), which is why it can be tempting to look at this product as if it was the result of some clever marketing fodder. Not so fast. According to the American Osteopathic College of Dermatology (AOCD), Accutane is a form of ingestible vitamin A. Seeing as Accutane is one of the most effective anti-acne prescription medications out there, it's only apt to think that Dirty Lemon's ingestible retinol could make a real and noticeable difference in the appearance of the skin as well. Along with "pro-retinol," the drink is also formulated with anti-inflammatory pineapple juice, antibacterial and vitamin-rich ginger, and antioxidant-rich hibiscus flower. So, not only do they provide an extra slew of skin benefits, but they also make the drink taste amazing. Byrdie's editorial director, Faith Xue, had the chance to try the drink ahead of the launch. She describes it as "the best-tasting Dirty Lemon drink I've tried—like a tart lemonade with a hint of fruit punch flavor." Rest assured that this isn't one of those beauty waters you have to hold your breath in order to drink. 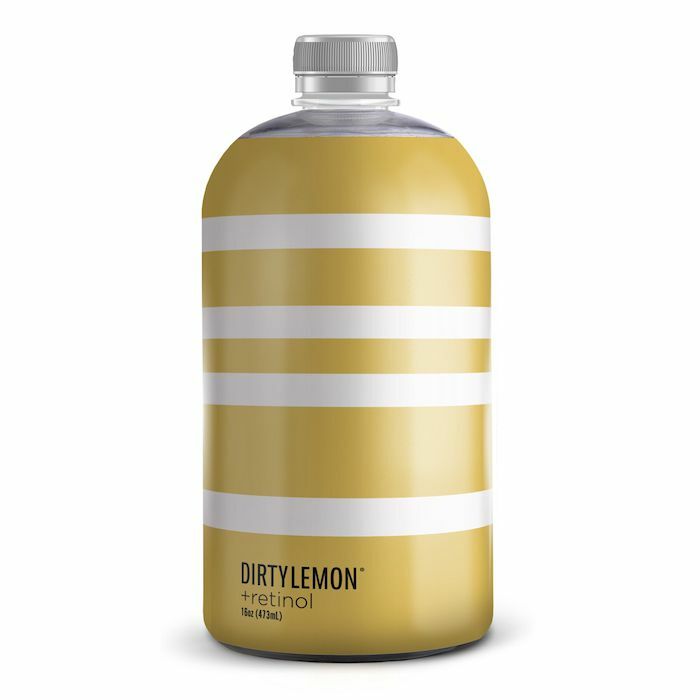 The Dirty Lemon +retinol drink is available now on the brand's website. Next, check out the Okinawa Diet, which is the buzziest new diet taking over in wellness circles everywhere.